Līdz 15. novembrim žurnālisti aicināti piedalīties Belarus in Focus žurnālistikas konkursā. Darbi tiks vērtēti profesionālās un pilsoniskās žurnālistikas kategorijās. Rakstu tēmai jābūt saistītai ar socioekonomiskiem un/vai cilvēktiesību aspektiem Baltkrievijas prezidenta pēcvēlēšanu laikā 2010. gadā. 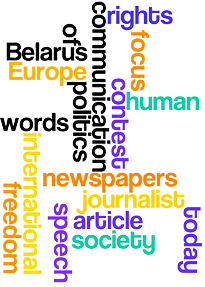 Nordic Council of Ministers in partnership with other sponsors is currently seeking entries from journalists who are citizens of an EU country, Switzerland, or Norway for the Belarus in Focus Journalism contest. The competition is coordinated by Solidarity with Belarus Information Office, in cooperation with the Polish Press Club. Other partners include: the European Federation of Press Clubs, Office for a Democratic Belarus, the German Marshall Fund, Civic Belarus, House of United Belarus, and the Belarusian Association of Journalists. There are two categories of entrants to the Competition: professional journalists (people whose articles are regularly published in return for payment) and citizen journalists (those who publish on a blog open to the public). Those entering the professional journalist category should work for a publication that publishes either in one of these countries, or in the international press. The article submitted must have been published between December 19, 2010 and November 15, 2011 in the European or international press. If the article was written in any language other than English, a translation into English should be provided, as well as the original. If accepted for publication, articles not originally written in English will be professionally edited or retranslated into English. All articles will be translated into Belarusian. The judging panel will pay attention to the content of the article above stylistic issues. not contain any xenophobic, discriminatory, or offensive statements, or be untruthful or misleading. The Competition is open to journalists who are citizens of an EU country, Switzerland, or Norway, and who are resident in one of these countries. The Competition is not open to employees of Solidarity for Belarus Information Office or their family members, or anyone else connected to the Competition. Selection ProcessThe top ten entrants in each category will be notified by the first week of January. The top three entrants will be invited to a workshop with Belarusian journalists, hosted by Press Club Polska, in February 2012 in Warsaw. Runners-up may also be invited if any of the finalists are unable to attend. The official announcement of results will take place during a press conference, to be held during the journalist workshop in February. About the PrizeThe top three entrants from both categories will be invited to attend a two-day workshop with Belarusian journalists that will be held in Warsaw in the first two weeks of February. During this time, a press conference will be held at which the prizes will be officially presented to the winners. Professional Journalism:1st place: 2,000 EUR, 2nd place: 1,000 EUR, 3rd place: 500 EUR. Citizen journalism:1st place: 1,000 EUR, 2nd place: 500 EUR; 3rd place: 250 EUR. Seven articles by runners-up will receive a recommendation to be published in a bi-lingual book, alongside the articles of the winners. Last date for submission of entries is November 15, 2011.